SALT LAKE CITY, Utah – DigiTech today announced the introduction of its Drop, a dedicated polyphonic drop tune pedal that lets guitar and bass players instantly lower their tuning from one semitone all the way down to a full octave. With the Drop, guitarists can get down-tuned chunk without having to change guitars or re-tune between songs and bassists can delve into deep bass depths even lower than a five-string low B. 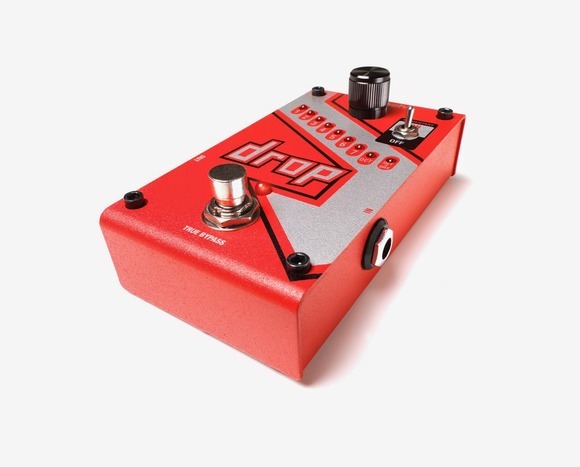 Featuring polyphonic drop tune algorithms drawn directly from the legendary Whammy DT™ pedal, the Drop makes it easier than ever to get down. One look at its bold red, black and white graphics and its clear the DigiTech Drop shares its DNA with the iconic Whammy DT. The Drop offers a choice of eight drop tune and pitch-shifting intervals from one semitone (half-step) to a full octave down, plus an Octave + Dry mode that blends the original signal with another note an octave down. The Drop incorporates the same polyphonic pitch-shifting algorithms as the Whammy DT, to perfectly track notes and chords for precise drop-tuning performance with no glitching or lag. The Drop features a Momentary/Latching switch to create dazzling hammer-on and pull-off type effects. Players can instantly get a drop in pitch of the notes they’re playing by stepping on and holding the footswitch – then releasing it to instantly go back up to pitch to add dramatic musical impact. The Drop features true bypass operation, which keeps the pure tone of the instrument intact when the effect is not engaged. Its metal chassis is built to withstand night after night of constant gigging and its red LED is easy to see. The compact Drop is operated via its 9-volt input and included power supply. The DigiTech Drop will be available in July 2014 at a suggested retail price of $249.95. HARMAN (www.harman.com) designs, manufactures, and markets a wide range of infotainment and audio solutions for the automotive, consumer, and professional markets. It is a recognized world leader across its customer segments with premium brands including AKG®, Harman Kardon®, Infinity®, JBL®, Lexicon®, and Mark Levinson® and leading-edge connectivity, safety and audio technologies. The Company is admired by audiophiles across multiple generations and supports leading professional entertainers and the venues where they perform. More than 25 million automobiles on the road today are equipped with HARMAN audio and infotainment systems. HARMAN has a workforce of 15,200 people across the Americas, Europe, and Asia and reported sales of $5.1 billion for the last twelve months ended March 31, 2014.